So much for all the Maps thunder and Lightning port issues, and what they might mean for sales of the iPhone 5: a new survey published today by 451/ChangeWave Research reveals that in fact Apple’s latest mobile device is selling at “record” rates compared to past iPhone launches. Its survey — canvassing opinion from 4,270 North American consumers — also canvassed opinion on whether Windows Phone 8 — Microsoft’s latest mobile platform — may be a strong third competitor alongside Apple and Google’s Android. But despite all the effort that Nokia has been making to become the primary beneficiary of that, for the moment it is Samsung that is best positioned to reap the benefits. The caveat to this research is that it is about buying intention rather than actual purchases, but ChangeWave’s surveys in the past have proven to be effective barometers for what eventually happens to the bottom line. So to the results: ChangeWave found that some 32% of respondents said that they were likely to buy an iPhone 5 as their next smartphone — within that 19% said ‘very likely’ and 13% ‘somewhat likely. That was more than enough to show that the new phone is generating more demand compared to the last major phone release from Apple, the iPhone 4S, with ‘very likely’ going up by almost 100%. ChangeWave also asked consumers about all the bad press Apple has been getting around Maps and the new Lightning port chargers — this device’s equivalent of Antennagate. Turning to maps, the results seem even more stark, considering how much attention the issue has had, not just in the media and outspoken users on social networks, but even from Apple itself. Asking those who had already upgraded to iOS 6 or are already owners of iPhone 5 devices, 90% said that there was either “no problem at all” with Maps or that they “haven’t experienced any problem.” Only 3% called it a very big problem, and 6% said it was “somewhat” an issue. 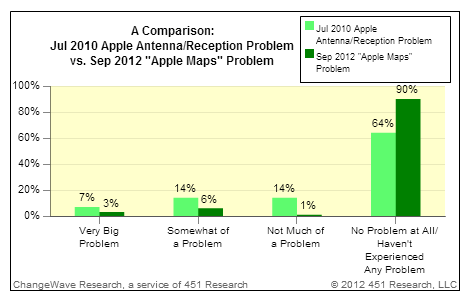 Interestingly, comparing these problems with Antennagate, it turns out that people were a lot more upset by reception issues on the iPhone 4 than they have been with iPhone 5’s bad press. Given how well the iPhone 4 has sold for Apple, this could be a very strong indicator of how well the iPhone 5 will sell. What’s interesting is that the biggest barrier to iPhone 5 purchases is not things like Maps functionality, but that fact that in North America we have reached a penetrated market when it comes to smartphones. This is something that researchers have been pointing out for a few quarters now, noticing an overall slowdown in purchases. In the ChangeWave research, this is played out in the numbers, too. Some 61% of users said they were unlikely to buy the phone because “their current cell phone is sufficient.” No-one — 0% — said it had to do with functionality issues. And that brings us to viable competitors to the iPhone. Of course there is Google’s Android, now the world’s most popular smartphone platform. But Microsoft has been gunning for a piece of the action, most visibly in the form of a large deal with Nokia to get what was once the world’s biggest handset and smartphone maker to switch all its smartphones over to its platform. Microsoft’s big crack at the market is here now, with the Windows Phone 8 OS, which, like Google’s Android, is being used by more than one OEM, with other handset makers including HTC and Samsung alongside Nokia. 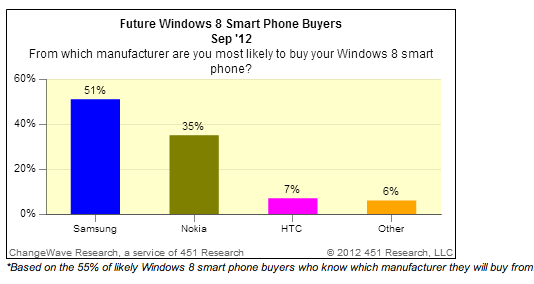 The big issue seems to be that not many intend to buy Windows Phone devices. Just under 1 in 10 respondents (9%) said they were likely to buy one in the future (only 2% “very likely; 7% “somewhat likely”). Compare that again to the iPhone 5’s 32% and you can see the challenge that continues to face Microsoft and its OEM partners ahead of a full commercial launch of the platform. ChangeWave is more optimisitic: “Considering marketing has yet to begin, these findings show Windows Phone 8 will likely have a substantial impact on the smart phone industry,” writes Dr Paul Carton, VP of Research. When it comes to those who do intend to buy a WP device, just under half said they were still undecided about which brand to buy. But among those who have made up their minds, it’s not great news for Nokia. Nokia isn’t drastically far behind at 35%, but it shows that despite all of the work it has done to raise its profile with users in North America, it still hasn’t cracked the stronghold that Samsung, the world’s biggest handset maker, has on the market. HTC and “other” handset makers are also finding it very hard to get a look in.